> Yesterday, Ryan Braun, in the midst of the whole drug story, decided to back out of the Brewers On Deck that takes place this weekend. This was sort of expected; I can only imagine the tension he’s feeling right now waiting for the arbitrators to decide his fate. He claimed he withdrew from the fest to avoid questions about the matter. But, if you’re a true Brewers fan, hopefully you wouldn’t have questioned him about it. I would have expected him to get a standing ovation just for how well he’s dealt with this situation, but I guess we won’t know what would have happened now. The appeal process appears to be almost finished. 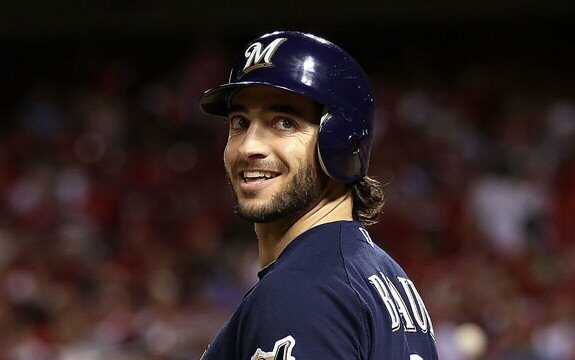 Braun appealed in front of three arbitrators on January 19, two days before he accepted his MVP award at a dinner in New York. However, he’d reportedly been trying to get an appeal ever since ESPN first leaked the news (that we shouldn’t know about) back in December. I’ve already said this multiple times, but, if (when, hopefully) Braun isn’t guilty of taking PEDs, I hope ESPN receives a severe punishment, and I mean severe. ESPN doesn’t give a crap about baseball in the first place, but of course when there’s something that makes the sport look bad, they jump right on it. Skip Bayless better be fired, at the least- and I wouldn’t mind a few of their other irritants leaving either. If it were up to me, I would have ESPN shut down for this; if Braun is innocent, this will be my last straw for them. But we all know that isn’t going to happen. > Two Brewers Minor Leaguers made MLB.com’s Top 100 Prospect List, created by Jonathan Mayo. Both were starters- Wily Peralta got 49th, and recently drafted Jed Bradley got 97th. Peralta is just 22, and is showing some signs maturity. He went a combined 11-7 with a 3.17 ERA at Double-A Huntsville and Triple-A Nashville. In Nashville, he went 2-0 with a 2.03 ERA. 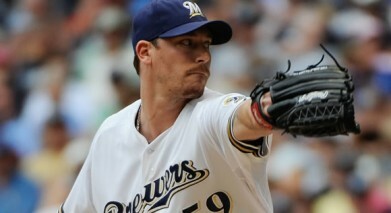 Peralta will probably reach the Majors at some point in 2012, whether it’s as a spot starter or long reliever. My only issue with Peralta is what I saw from him in Spring Training 2011. He seemed fine against Minor League teams. But, when pitching against Major League teams in Spring Training, he seemed to lose all of his command. If I recall correctly, he gave up five runs and five walks in just a third of an inning against the Rockies. I assume that was just him getting his nerves out, but hopefully he’s over that and can pitch in the Majors this year. 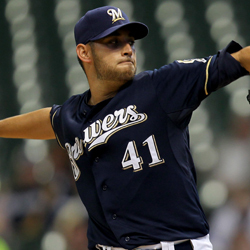 Bradley was one of two first round picks the Brewers received in 2011, the other being Taylor Jungmann (but he promptly got injured… the Brewers have the best luck with young pitchers). I saw Bradley pitch in the Rising Stars game (or some game in the AFL that was broadcasted on MLB Network), and he looked great, striking out two in what would have been a perfect inning; I believe whoever was playing shortstop made an error. Anyway, I think Bradley could soon make the Majors. And, if he doesn’t stay a starter, I could definitely see him being a lefty specialist; although that’s probably not what he’s interested in. > And that’s about it. I was going to write a post for Reviewing the Brew tonight, but I’ll have to once again procrastinate that- I haven’t thought of a topic yet. But I probably will have by tomorrow night. > Sorry for such a late post. I’ve been busy today, but I’m just going to try and quickly go through the Brewers’ news released today. > Doug Melvin announced earlier today that the Brewers won’t be major players at the Winter Meetings this year. 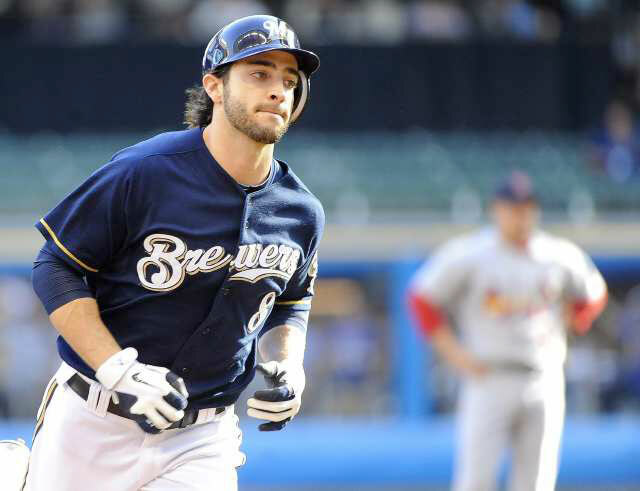 I guess this was expected, although the Brewers do have a few holes to fill, such as a shortstop and relievers. Not nearly as many as they did in 2010, however. By the way, if you don’t already know, the Winter Meetings are in Dallas this year from December 5-8. > The Brewers just can’t get a break as far as Minor League pitching goes. Pitching prospect Santo Manzanillo separated his right shoulder in a car crash earlier today in the Dominican Republic. This came a few days after Manzanillo was put on the 40-man roster for protection from being plucked away in the Rule 5 Draft. Anyway, who knows what this injury is going to do to his arm. It could affect him a lot because he’s a power pitcher, shown by his numbers- 1.75 ERA and 17 saves between Class A Brevard County and Double-A Huntsville. Notice how this occurred in the Dominican Republic. At this point, I’m starting to get shaky about Major League players leaving the country to return to their native countries for offseason exercising or winter ball, because it seems like bad things continue to happen. Wilson Ramos, Greg Halman, and now this. I hope this is the end of it. > And that’s about all the Brewers news. There were some major signings around the rest of the MLB, however. > The Red Sox may have finally found a new manager in Bobby Valentine. Reports are saying that both sides are close to a deal. Plus, it was reported that Gene Lamont is no longer a contender for their managerial position, leaving Valentine as the only choice. > The Royals signed former Dodgers closer Jonathan Broxton to a one-year deal today. Broxton, typically a closer, is probably going to set up for All-Star closer Joakim Soria. I’m always tempted to make jokes about Broxton’s weight (he weighs 300 pounds) even though I know I shouldn’t; then I remember his insanely high strikeouts per innings pitched. He has struck out 503 batters in just 382 innings, which is 11.55 strikeouts per nine innings. > The Cubs are apparently interested in both Albert Pujols and Prince Fielder. Hopefully they’re smart enough to know they can only sign one. > And that’s all I’ve got right now. Again, sorry for such a late post; I’ll probably update this with more links tomorrow. But thanks for reading, and feel free to leave your thoughts. 3:29p This actually happened much earlier today, but I’m just getting around to posting it now. 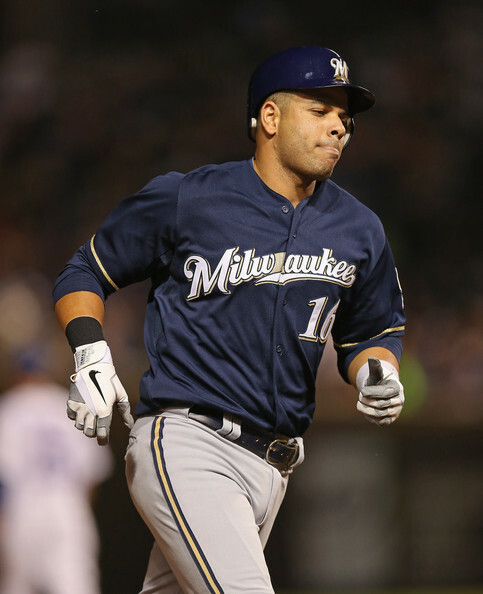 The Brewers acquired versatile veteran Jerry Hairston Jr. from the Nationals earlier today. This is the second move in as many days that GM Doug Melvin has made to make sure the Brewers have insurance at second base due to Rickie Weeks’ injury. Melvin also acquired Felipe Lopez from the Rays yesterday. Anyway, Hairston provides more insurance than just at second base. In 75 games this season, he’s played 44 at third base, 22 in left field, nine in center field, three at second base, and one at shortstop. That shows how versatile he is in both the infield and outfield. Aside from insurance at second base with Weeks out, Hairston can also help in center field, where the Brewers recently lost Carlos Gomez to a clavicle injury. Hairston is hitting .268 this year, but has hit .317 in his career at Miller Park. He’s a .258 hitter for his entire career. 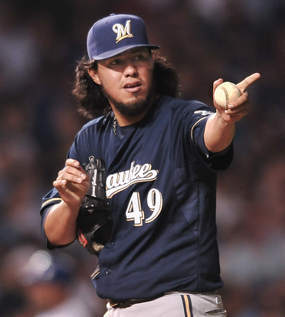 To make room for Hairston on 40-man roster, the Brewers moved lefty reliever Mitch Stetter from the 15-day DL to the 60-day DL. It’s been confirmed that Stetter will not be pitching again this season, as he’ll be undergoing season-ending hip surgery on Tuesday. The Brewers gave up Minor League outfielder Erik Komatsu, who was hitting .293 this year at Double-A Huntsville. He was also the reigning Minor League player of the year, but Melvin said that the Brewers have a lot of depth as far as outfielders go, so he was fine with this deal.